The bashful okapi lives in one place in the world, the 24,000-square mile Ituri Forest in the northeastern Democratic Republic of Congo. Related to the giraffe but resembling the zebra, okapis graze along the Congo River, clinging to canopied rain forests and stream banks and rarely venturing into savanna or swampland. Their home between the Nepoko and Ituri Rivers contains some of the richest species diversity in Africa. The okapi, or Okapia johnston, live in thick evergreen forests at elevations of 1,600 to 5,000 feet where the temperature is a mild average of 75 degrees each day and the air is moist with humidity. At least 2 inches of rain fall each month and sometimes as much as 66 inches of rain falls in a year. The okapi's forests experience two rainy seasons, March through May, and August through November. The rest of the year the area is drenched with sunshine, receiving 2,000 hours of sun each year. For okapis who live in captivity, the ideal climate is a controlled environment that can offer a climate similar to their Congo home. The best temperature range for an okapi enclosure is 66 to 78 degrees Fahrenheit, according to the Okapi Management website. If the animals live outside, they can tolerate outdoor temperatures as low as 40 to 55 degrees. However, the animals shouldn't be exposed to temperatures lower than 40 degrees. As rain forest dwellers, okapis also are accustomed to humidity, so indoor enclosures should provide 50 to 60 percent humidity in the air. In 1992, about 20 percent of the Ituri Forest was designated as the Okapi Wildlife Reserve and is protected as a World Heritage Site, according to the Wildlife Conservation Society. About 5,000 okapi live within the reserve, a park with more types of wildlife than anywhere else in Africa. In 2008 the International Union for Conservation of Nature and Natural Resources estimated that the total okapi population was between 10,000 and 35,000. The IUCN Red List of Threatened Species lists the okapi as a "near threatened" species, largely because of human settlement and the development and destruction of the natural environment. Logging, slash and burn farming and other methods of deforestation threaten to destroy the okapi's forest. 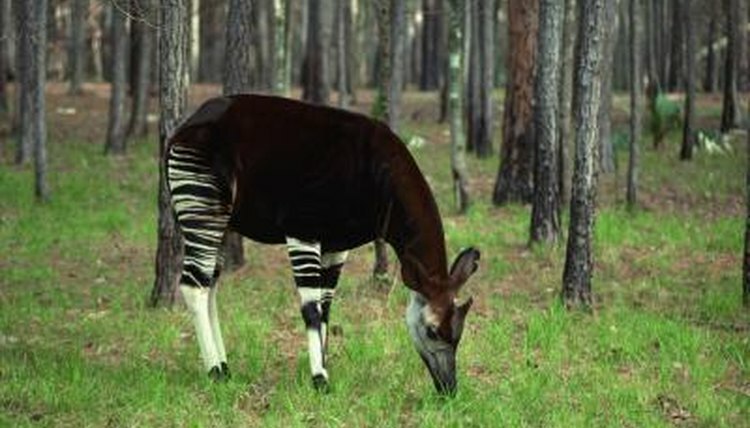 Regional conflicts in the 1990s also put the okapi and his environment at risk. In addition, the okapi is valued for his meat and coat and is hunted for personal use and for commercial bushmeat markets. What Kind of Climate Does the Red Panda Live in?